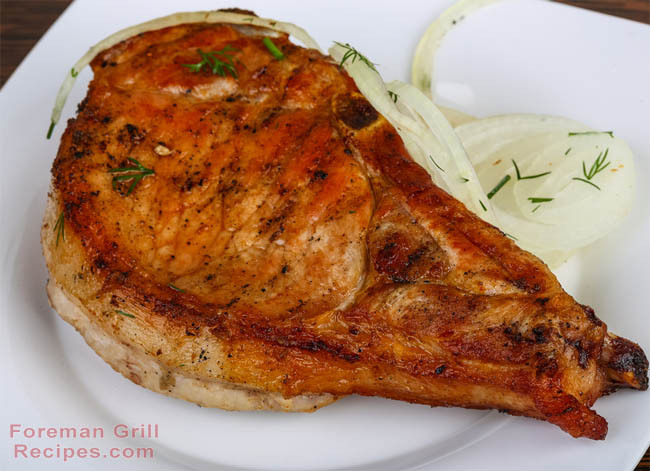 Pork chops are delicious and easy to make on your George Foreman Grill. They are very versatile and can be prepared any number of ways with ease. We recommend using center-cut boneless chops, cut to 1/2″ to 3/4″ thick for your Foreman Grill, to produce optimal results. For this particular recipe, there are many different types of dijon mustard you can use. Use a course stone ground dijon mustard for a very bold and robust flavor – but use sparingly as it can overwhelm the taste of the meat. A lighter honey dijon mustard will provide a more subtle and sweet flavor. Rub pork chops well with all ingredients on both sides and let sit covered in refrigerator for at least 15 minutes. Preheat your George Foreman Grill for at least 5 minutes on high. Grill pork chops for 6-8 minutes. When done they should be slightly pink in the center. Serve with additional dijon mustard and your choice of side dishes. Can I cook pork chops on the bone in the Foreman Grill? That’s the kind I happen to have that I want to fix for supper tonight.